Robin Hood is a legendary character who lived in Sherwood Forest along with his band of merry men. They were famous for robbing the rich and giving the wealth to the poor. 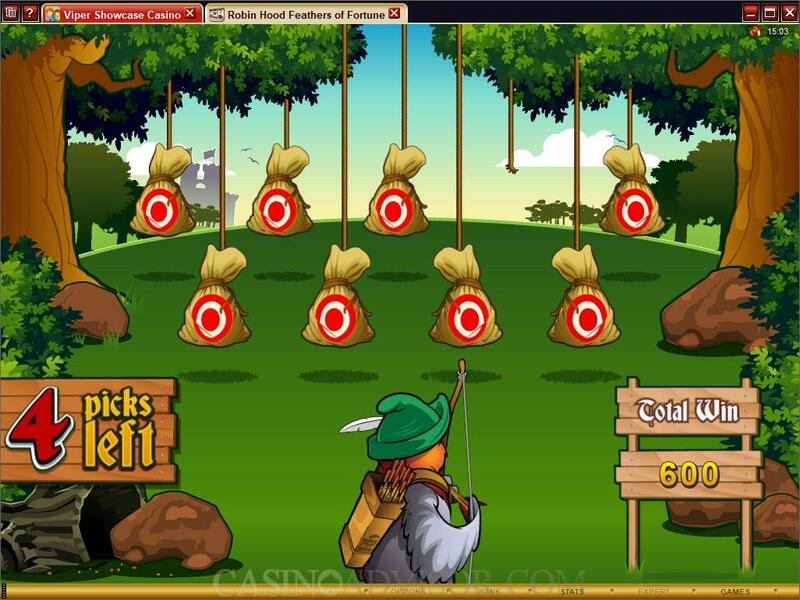 Robin Hood: Feathers of Fortune recreates the legends on the reels but with different birds essaying the characters. The choice of the birds and the depiction of the characters is such that those familiar with the Robin Hood legend will easily recognize the characters. Robin Hood is the robin wearing the green feathered cap and carrying the long bow. Robin Hood’s love interest, Maid Miriam, is a white dove. The big Little John is a pigeon carrying his favorite weapon, the staff. Friar Tuck is represented by the wise owl. And Robin Hood’s arch enemy, the Sheriff of Nottingham is appropriately a villainous crow. The other thematic symbols are Robin’s Bow and Arrows, a Purse of gold coins, the Target for arrows, the Horn, the Wanted poster and the Robin Hood Logo. 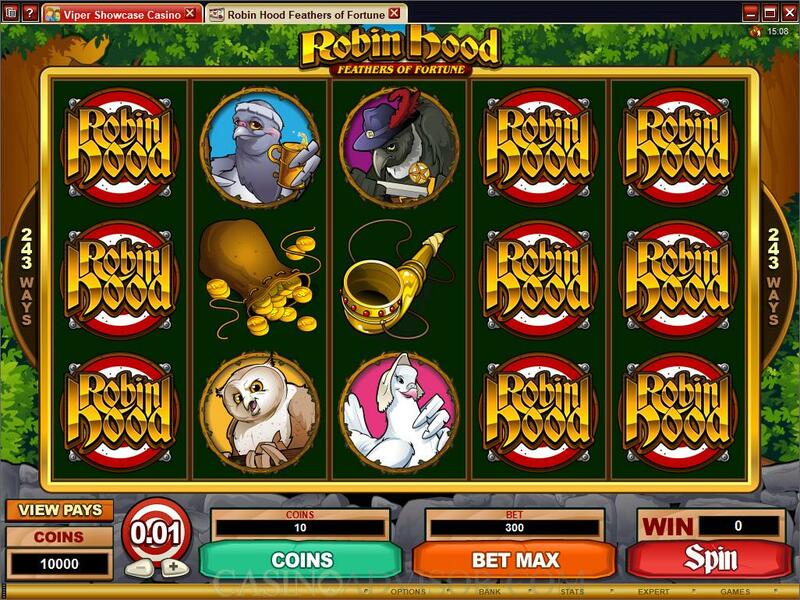 Robin Hood has 243 ways to win and all are automatically enabled. Symbols appearing in successive reels in any position starting from the left most reel results in a winning combination. The coin size can be selected from 0.01, 0.02 and 0.05. The player can wager up to 10 coins per payline. This determines the line payouts. The total number of coins per spin is 30 times the number of coins selected per payline. Hence the maximum amount wagered is 300 coins. The scatter payouts are based on the total number of coins wagered per spin. The maximum number of coins that can be won in a given spin is 1,215,000. The Robin Hood Logo is the wild symbol. It can appear stacked in the base game and in the free spins. The Wanted Poster is the scatter symbol. Three or more of these symbols appearing anywhere on the reels offer scatter payouts up to 100 times the total bet. They also activate the free spins bonus round in which 15 free spins are awarded to players at doubled payouts. The free spins can be retriggered. 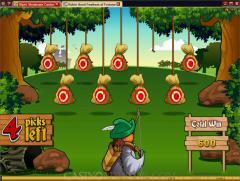 Robin Hood also offers a bonus game on the second screen that is triggered by the Robin Hood bonus symbol appearing simultaneously in reels 1 and 5. It is a simple pick X out of Y objects game called the Archery Bonus round. The objects are targets suspended from a tree. After the player selects the target Robin hits it with an arrow revealing the bonus credits. The credits for the five selections are added up and multiplied by the total bet. 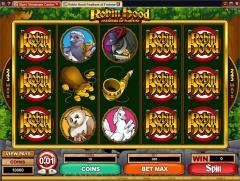 All the regular features of Microgaming slots are available in Robin Hood. These include customization options, game statistics and a comprehensive Auto Play Feature. Players can activate 5 or 10 auto spins directly. For a larger number of auto spins players have to use the set up menu. There is no progressive jackpot in Robin Hood. The fixed jackpot payouts are also not that attractive. But this is made up by the 243 Ways feature that results in more frequent payouts. Interested in reading more detailed information about Robin Hood? If so Click Here for more details.